This ruler will help you draw precise, great looking curves between two points. This type of curve is called a Cubic Bezier curve, and is defined by two outer points connected to two independent control points. The control points define tangents to the curve at the outer points. These tangents are visually extended so that you can align them easily with other lines or curve segments. You can rotate and scale them by using the green and yellow control points. The center control point allows you to change the shape of the curve without changing the two outer points. 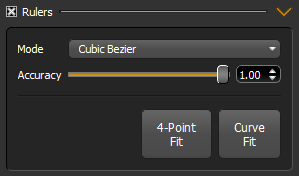 If you want to draw simpler curves, be sure to check out the Quadratic Bezier ruler! Once you've defined a curve you like by setting the control points, you can draw along this curve. You can also draw offset curves by starting from any position not on the main control curve. These offset curves (also known as parallel curves) try to keep the same normal distance to the control curve at all points. Interestingly, the parallel curve of a bezier curve is itself not a bezier, and you will notice that some offsets have self-intersections and cusps. The 4-Point Fit function will help you setup your curve by clicking on where you want the start, two middle (t=0.25 and t=0.75), and end points to be. Shift Scale the entire curve against the opposite control point.